The Bestselling Action Game From Japan. Easily one of my most favorite arcade games that remains hugely challenging to this day. This is my small ode to Thexder, otherwise known as “that game with the Robotech-like character and intro music by Beethoven”. In fact, I have considered it THE most difficult game ever for a long time, reserved only for the most masochist and twisted of gamers. 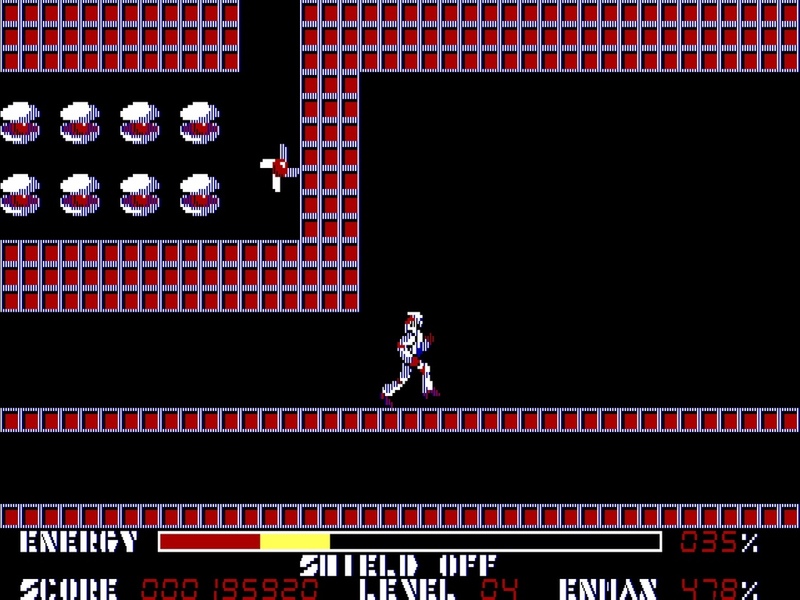 Thexder is infamous for throwing you in many occasions into wide open areas with hundreds of enemies attacking you from every conceivable direction. I’m kidding you not; it’s been admittedly many years since I played it fully, but I’m fairly positive that at one point I counted well over a hundred enemies in one single location. Truth to be told, I wasn’t that familiar with the world of consoles then, and over time I realized that there may be quite a few more difficult games out there than Thexder. 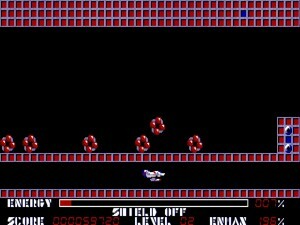 Mind you, I’m still frightened whenever I remember those tormenting levels and enemies. So, Thexder is also particularly noteworthy for being the first game that Sierra Online imported in the United States from Japan, in 1987 to be precise. The next ones where Silpheed and Zeliard, which we previously discussed here. Originally released in 1985 by Game Arts for the NEC PC-88 platform, Thexder became a huge hit in Asia selling about 500.000 copies. Half a million in the mid eighties was an achievement alright. 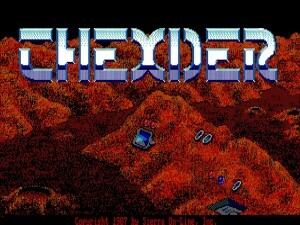 The game was subsequently ported to the NES and MSX by Square and Game Arts respectively, and Sierra did their part for the IBM PC, Amiga, Tandy and many Apples. While there aren’t any official numbers, it is known that the game continued to be a huge success in the US. We may be talking here about the earliest arcade hit in home computers. I truly can’t think of another successful arcade like this within 85-87. Actually, Thexder rivaled real arcade machines in terms of gameplay, and its influence can’t be appropriately measured. Case in point, ever heard about that Metroid franchise? That’s popular, right? Well, the first Metroid was released in 1986, one year after Thexder, and I’ll be damned if there aren’t some undeniable similarities between both games. Another notable follower can be traced to Turrican, you know, one of the greatest platform games ever in any system. Now that is what I call influential. What’s the drill then? 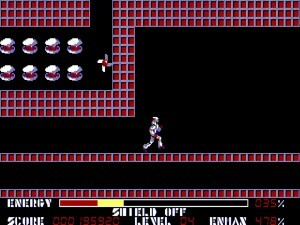 As a mech-like robot who can turn into a jet, you must find your way through sixteen increasingly difficult levels and either fight or avoid countless of many varied enemies. Like I said before, running away may be the only reasonable option when you’re chased by a horde of tiny little floating robots. 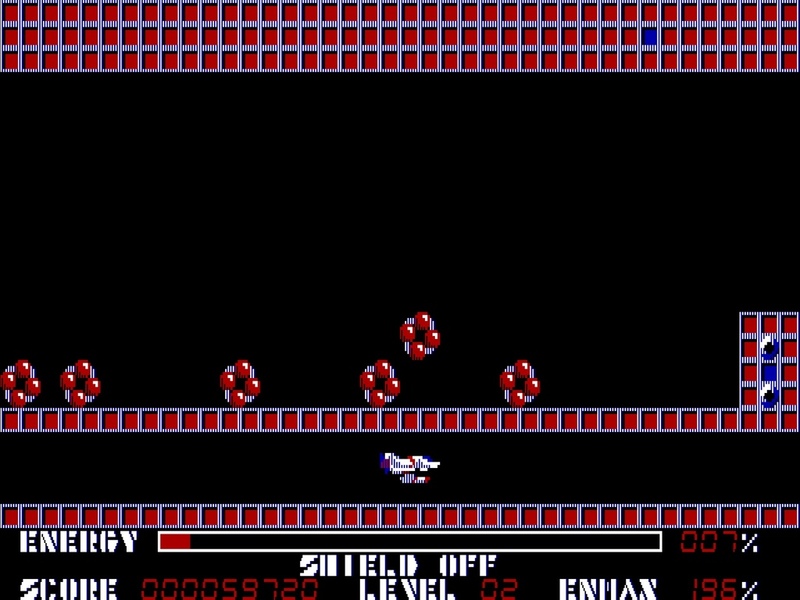 The gameplay mechanic of Thexder was quite novel: you shoot a stream of auto-targeted lasers that aim enemies in sequence, from nearest to farthest, but this reduces your energy which also acts as your life. So you can’t afford to carelessly shoot every time you want. Of course, whenever an enemy touches you, your energy goes down; and it goes down fast. Fortunately, killing some enemies do return energy and scattered throughout the levels are some awkward static thingies that when eliminated give you back a 5% or so. Very interesting approach to say the least. Remember, we’re talking about 1985 here — among the most notable arcade games of this year were Dig Dug II, Exerion, Gauntlet, and one of my favorites, Mag Max. Thexder felt light years ahead! Anyway, most levels are very twisty, requiring going back and forth between your robot and jet modes to bypass certain areas. 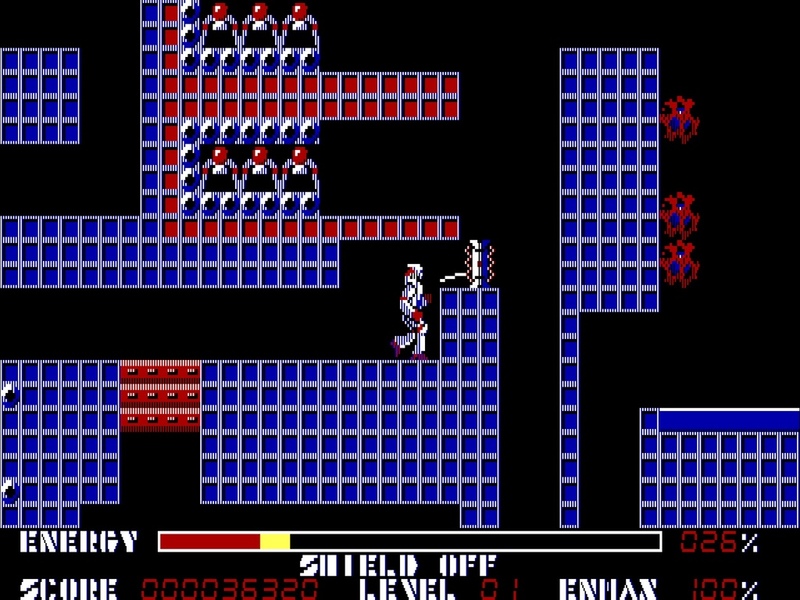 Most of the time you must fight as a robot though because controlling the jet is awfully difficult. 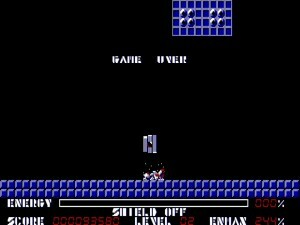 That said, what might sound like a gimmick is in reality a very unique part of the gameplay since the jet is ideal to run away from enemies, adding a certain strategic component to the game. Incidentally, stepping on any kind of enemy drastically reduces your energy, even those things that give it back. There are hazards like lava that hurt your robot as well. Basically, about 60% of everything that appears in the game can hurt you. Knowing when to run away is crucial indeed. For instance, I remember how my energy was at 20% while I was flying through a tiny tunnel, and all of a sudden that tunnel becomes a vast wide open area with hordes and hordes of creatures. All I was able to do is fly away in panic and try to recover energy. Actually, I wonder if Thexder is the culprit of my problems with blood pressure… Seriously, the levels are huge in scope, epic even; not even Metroid can touch them. Speaking of the enemies, it’s hard to describe them: they are mostly abstract little robots or alien creatures which are funnily animated, either pulsating or rotating all the time. It’s true that they resemble animated GIFs, but it’s still a sight to behold when you have dozens and dozens of tiny animated GIFs chasing you around on screen. Definitely a varied cast as well since I believe the number of sprites surpassed the 50 mark. There are a few hidden quirky things like a geisha or a baby that give you many points or upgrade your max energy (ENMAX). Oh, I almost forgot to mention, you have one life only. That is, when your energy comes down to 0%, you’re kaput. See what I mean? Thexder is truly an amazing game. Of course, it’s impossible to understand its impact today, but in the mid eighties the “wow” scale was way off the mark. I became very obsessed with it, investing countless and countless of hours. For a long period, it was the only game I played. I had no idea what to expect either, no clue whatsoever about its length or number of levels. God, there was no Internet so I was literally in the dark. My first very pleasant surprise was reaching level five. 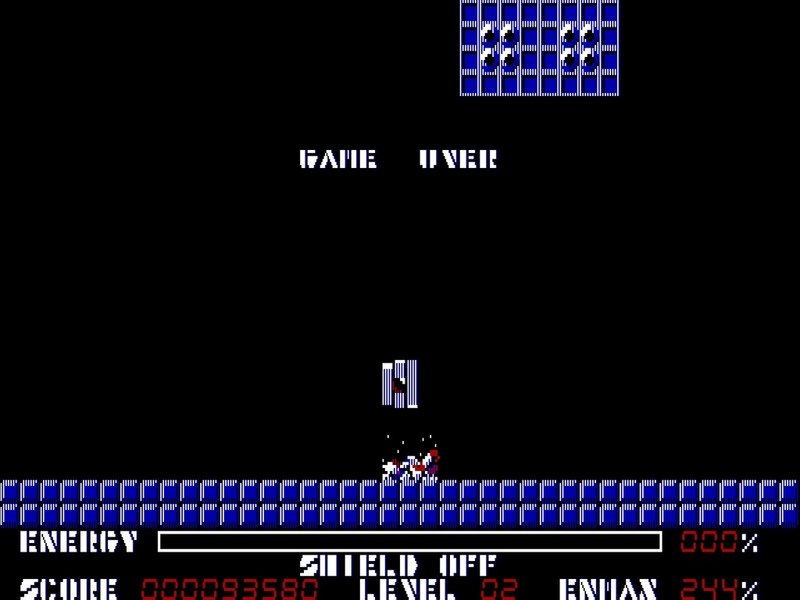 See, the first four levels where quite similar in style and I was afraid that the game would be all the same, but the fifth level casts you inside a cave and everything changed, enemies and graphics altogether. I realized then that the locations changed every four levels with their respective bosses, an amalgam of hazardous robotic parts, up until level sixteen. Beyond that I was disappointed because I was returned to the second level, albeit named seventeen but with no discernible differences. After literally months of trying, I mechanically exited the game, no longer motivated to keep playing. They could have included an ending of sorts, you know. Even a crappy “THE END” screen would have sufficed. There is no worse reward than cyclic gameplay. Still, Thexder remains a guilty pleasure of mine and I look forward one day to traverse all those anguishing environments again. There was a second part — Firehawk – which was somewhat lackluster, then a remake by Sierra in 1995 which was totally crappy, and recently a Thexder Neo reboot that was released for the PS3 and PSP. None of them can touch the first though, which is one of the most involving arcade experiences in the annals of gaming. They really don’t make them like this anymore. 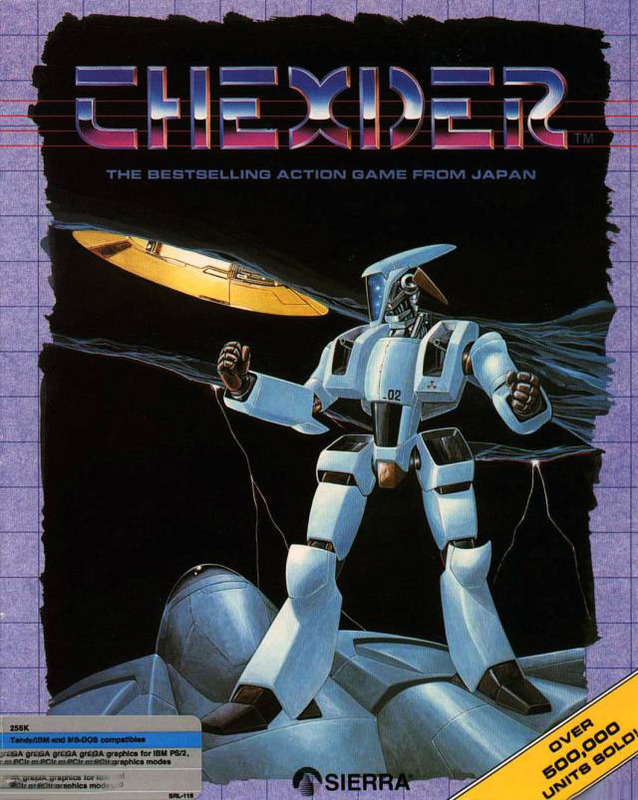 Ahh Thexder… one of the best games I had on my old MSX. Those bee-like drones in the second level were pure evil! I particularly liked that defeat was signaled by a mournful rendition of Moonlight Sonata over your burned remains. An overlooked classic deserving of recognition, this. Nice to see such a classic being reviewed properly. Good job. Thanks guys, really glad you all enjoyed the article! Thexder is a game deserving of even much more recognition IMO. You know its funny, I was thinking about this game the other day and now I’m seeing a very nastalgic and well written review of it. I completely forgot that Beethoven’s Moonlight Sonata was the game over music. I was pretty young when I played this game and Moonlight Sonata along with Fur Elise are my favorite Beethoven scores. Maybe its been my subconcious speaking to me all along. Anyway, glad I was able to relive a classic. This was also one of my favorite games. I wish someone would port the original version to a modern computer.